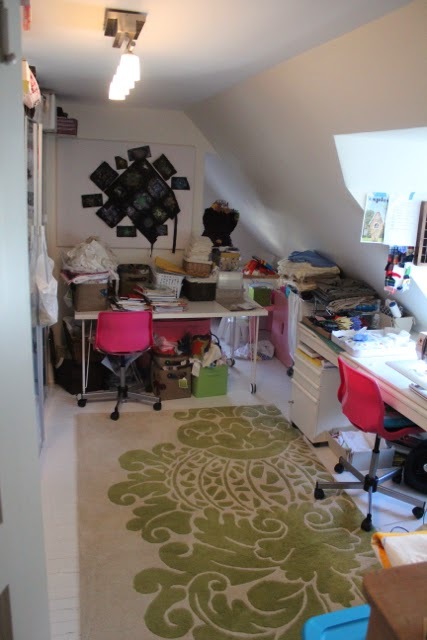 I've seen so many things recently about sewing rooms & creative spaces. And is it awful of me that I can't imagine many of them are really used. Why? BECAUSE THEY ARE SO CLEAN!!! 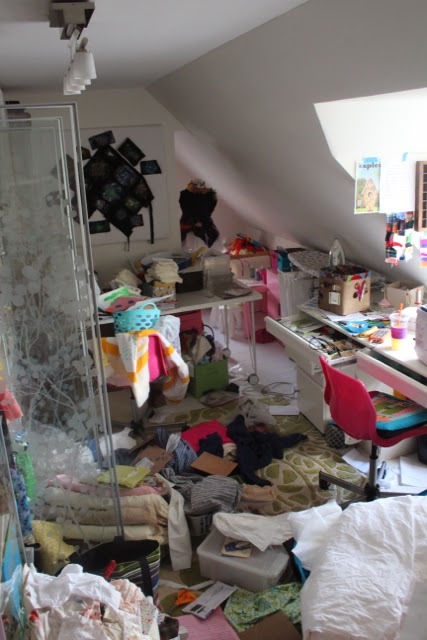 Is it just me who ends up with a sewing room that looks like this by the end of a busy week? Am I a sewing slob? Storage shelves line the walls with various bins in them. Storage bins are everywhere. On the table at the back you can see bins on bins. When a project begins it is designated a bin and there all the bits stay when I am not working on it until it is completed and then the bin moves on to house the next project. The shelves are Billy Bookcases from Ikea, the tables (which are on wheels - I can move them around easily if need be) are just plain white tops on Krille leg casters - the chairs are surprisingly comfortable at $20 a chair - it couldn't be better value. 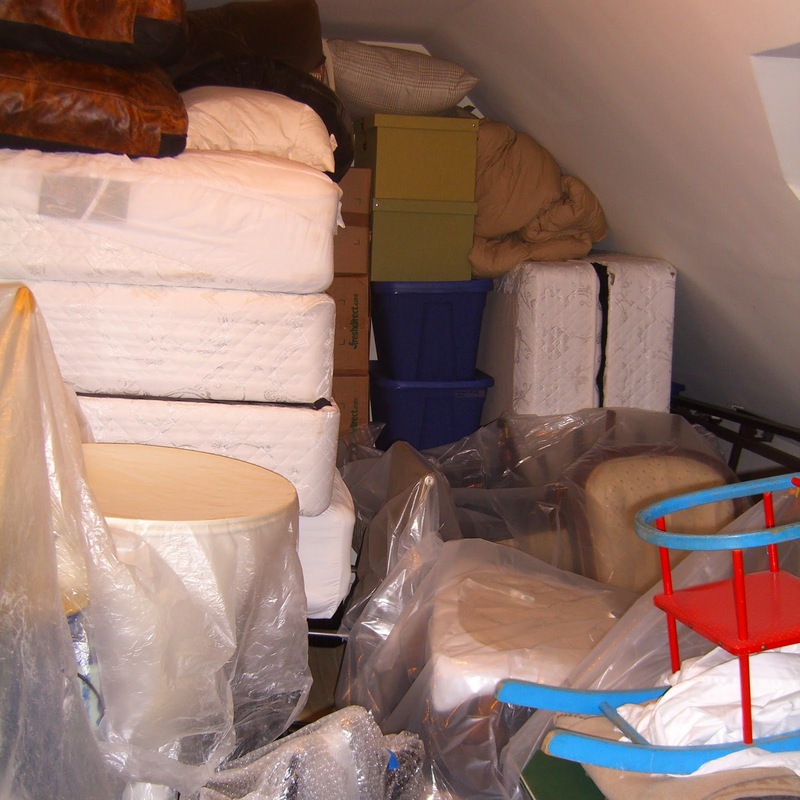 It is a pretty small space in our attic - but it is my private little room. "Mummy's Room" as it is referred to often. ... so you can see it has always been a space that was supposed to filled with organized chaos! I love your space, creative or not. Love those wall units. Must get myself some of those. My photos of my prettified sewing room were a fleeting moment of tidy perfection in what is normally chaos! I do use it honestly! I like the idea of a plastic box or bin for each WIP. 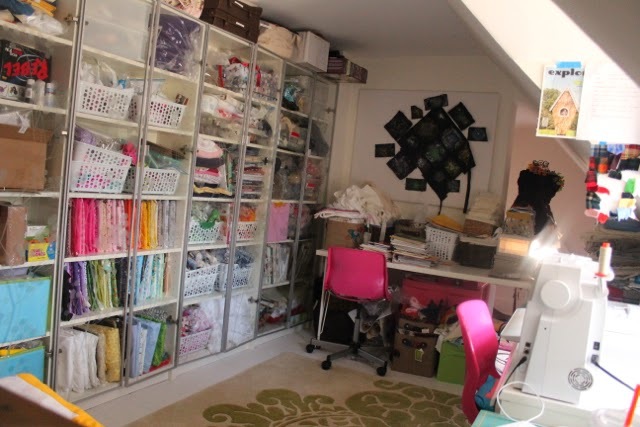 Your sewing room just looks like a lot of creativity goes on in there! work in progress boxes is a brilliant idea. I need some! Thank you ladies - I do need to work on the hurricane of chaos that I create - hopefully this post will shame me into being a bit tidier!